JOHN REUTER has been a photographer since the early 1970s, majoring in Art while attending SUNY Geneseo. He continued his studies on the graduate level at the University of Iowa, receiving two master’s degrees. It was there that he began to specialize in Polaroid materials, most notably his SX-70 constructions, combining photography with painting and collage. Reuter joined Polaroid Corporation in 1978 as senior photographer and later Director of the legendary 20x24 Studio. His own work evolved through large scale Polacolor Image Transfers to digital imaging in the mid 1990’s. He has taught workshops in Photoshop, Lightroom, Polaroid materials and encaustic painting around the world. In recent years Reuter has moved into video and filmmaking and is currently working on a feature length documentary titled "Camera Ready: The Polaroid 20x24 Project". It is always a challenge to distill a full film into a trailer or five minute summation. In this edit I wanted to show both the artists and Polaroid individuals who are key to the story. I chose longer passages of fewer subjects rather than several second snapshots of more people. The final film will draw for as many as 25 interviews. I have included a brief montage of historical footage with my brief narration. I have included the key artists William Wegman (who also is the figure in the opening with the dogs on the road in Rangeley, Maine), Chuck Close, Joyce Tenneson and Elsa Dorfman. Polaroid is represented by JoAnn Verburg and Eelco Wolf (who was my first artistic sponsor long before I worked for Polaroid). We close with the writer and critic A.D. Coleman, who has written extensively on Polaroid in his career and was a fierce critic of the sale of the Polaroid Collection in 2010 after the Polaroid bankruptcy. This is a solo exhibition in the Community Gallery of Polaroid Possibilities: The Art & Photography of John Reuter. This exhibitions presents John’s innovative and experimental work with Polaroid materials. The work included surveys John’s SX-70 Constructions, Polacolor Image Transfers and his work with the Polaroid 20×24 Camera. Polaroid Possibilities will be presented concurrently with Dare alle Luce by Ralph Mercer. The SX-70 work, which deconstructed the film packet to introduce painted and collage elements was the first major body of work John created with Polaroid materials. Seeking a new format Reuter began working with Polacolor II peel-apart film to create images with the “image transfer process”. This process allowed the dyes from the film negative to be transferred on to watercolor paper in lieu of the glossy Polacolor positive. These transfers became a starting point for a process of hand reworking that enhanced or transformed the image using retouching dyes, watercolor, pastel and dry pigment. Larger works became possible with the Polacolor material which was available in 8×10, 20×24 and multiple 20×24 panels to create works up to 40×50 inches. John Reuter started his professional career as a Polaroid research photographer becoming the main photographer in the Polaroid 20×24 Studio in 1980. The New York studio John ran was a key part of the Polaroid Artist Support Program and afforded him the opportunity to work with artists William Wegman, Chuck Close, Mary Ellen Mark, Robert Rauschenberg, Ellen Carey among others. John worked for Polaroid as a master photographer, lighting technician and ambassador. He was responsible for making the Polaroid materials and the work of other artists look their best. With inside access to new materials, the scientists, technicians and the resources of the corporation his personal work, exhibited here, continued to follow a divergent path started down in college. His work employs a hand crafted esthetic not expected from a talented technical photographer and contrary to how instant photography is typically perceived. His work combines photography and painting to create images one might think lifted from the pages of an art history textbook. Reuter remains the Director of the 20×24 Studio and is also an adjunct professor of photography at the Hartford Art School. The camera and original Polaroid film remain viable and are still available for artists and photographers to use through the 20×24 Studio. 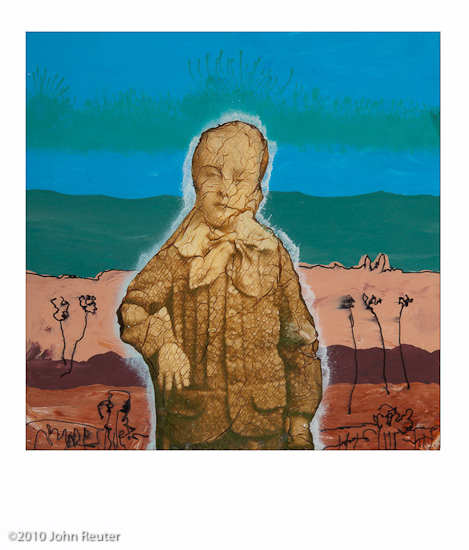 John Reuter’s mixed media images abstract the environments and subjects contained within each frame to such a degree that they could be interpreted as surrealist paintings. Pushed aside are notions of photography as a medium of truth and reality. 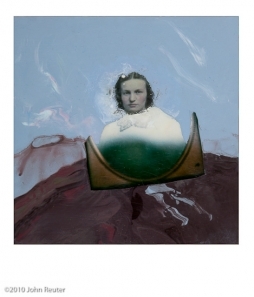 The viewer is invited into a realm where the Polaroid is deconstructed and paint, pastels or other images are collaged beneath the emulsion’s surface which is then positioned carefully back into place to assume the classic Polaroid aesthetic. Curator Barbara Hitchcock elaborates on Reuters work;“Shadows and Traces: The Photography of John Reuter” celebrates the artist’s innovative exploration of film technology, photography and painting coupled with his imaginative reinterpretation of people, places and things that have populated the real world. Reuter reinvents the past, stimulates our imagination, and encourages us to enjoy this flight into a familiar, yet somewhat unconventional, alternative universe. Born in Chicago and raised in California and New York, Reuter went on to receive his Bachelors of art from State University College of New York at Geneseo. He also received his Masters of Arts and Masters of Fine Arts from University of Iowa School of Art and Art History. In 2014 he made a documentary film, ‘Camera Ready: The Polaroid 20×24” project which chronicles the history of the Polaroid. Reuter currently is the director at 20×24 Studio and teaches at Hartford Art School. 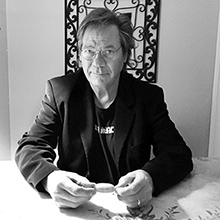 He has had numerous solo and group exhibitions of his work and taught workshops for the International Center of Photography and Palm Beach Photographic Center. Aperture, Henry Horenstein, the International Polaroid Collection of Cambridge, MA, and more have published Reuter. One of the more interesting aspects of putting together the Collaborations and Investigations exhibit is how it has challenged me to consider my working relationship with those I work with. For so many years I have insisted on keeping it separate, perhaps as much to protect myself as it is to avoid acknowledging how much of me there might be in my client’s work. It has always been impossible to compete with the totality of my 20×24 collaborations, it is what it must be like to be the “unknown Beatle”. And yet while my client work has been all over the place aesthetically and technically, my own work has managed to pursue a consistent path, albeit slowly and at times haltingly. Much of my aesthetic was determined quite early in my career. Studying with Michael Teres at the State University College of New York at Geneseo, I was greatly influenced by his open approach to photography. Michael believed that photography was like any two-dimensional medium, subject to manipulation and transformation. My earliest work explored the transformative aspect of photography working primarily with the figure. An equal influence was the philosophy of Michael’s wife, Rosemary Teres. Rosemary taught painting and art history at Geneseo and it was through her that I developed my combination of painting and photography. She also influenced me in seeking the “mythic reality” populated by a “hero” character. The notion of the hero (or heroine) is a constant in art history but one perhaps diminished in the era of minimalism and conceptualism when I began in the early seventies. In those schools of thought the artist remained the hero by decrying the purity of thought and execution but the notion of the hero was banished from the content of the work. So I began my journey against the tide of thought but it allowed me the freedom to pursue my own vision without much regard for whether I was current or not. I usually regard the birth of my present day work to reside in my SX-70s from 1975 to 1980. I was given a Polaroid SX-70 in late 1974 and my work was never the same. I was able to achieve in it the control over context and character relationships that I could only touch on in my black and white work. Combinations of painting and photography which I had hinted at previously came into full fruition in these reconstructed SX-70s. These pieces were actually photomontages contained within the frame of an SX-70 – “instant” image. While they were anything but instant they actually played off the notion of immediate feedback. It was here that I learned to work intuitively with the process and go with what chance would give me. I was never certain about the narrative path an image would take in advance, it was always determined in process. One sort of manipulation would yield an expression in a face that would then determine the colors or collage pieces to go with the central figure. If I were to repeat the image with the same elements again it would invariably come out differently. It set me up to create images by assembling the elements and then learning from their juxtaposition where the essence of the image would lie. It is a methodology I have used ever since. 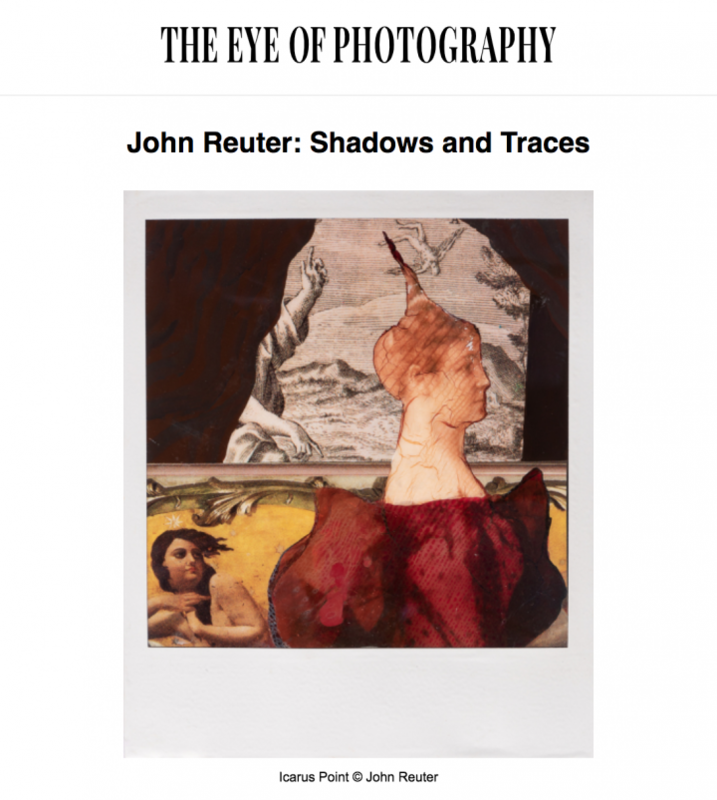 On the occasion of my exhibit “Shadows and Traces, the Photography of John Reuter”, a 40 year retrospective of my Polaroid imagery I thought I would republish an essay I wrote in 1997 for my exhibit at Pittsburg Filmakers and Silver Eye Gallery. In 1997 the Pittsburg Filmakers and Silver Eye Gallery in Pittsburg presented an exhibit of works from John Reuter’s personal collection of 20×24 images by the artists he has worked with for 18 years and his own experiments in Polaroid imagery. The exhibit was curated by Linda Benedict-Jones. The following text was written for the wall panels accompanying the images. “You have the greatest job in the world”. I have heard that on many occasions over the years that I have directed the Polaroid 20×24 Studio. I often just smile and kind of mumble that “it’s complicated”. For although it may not be as true as the person watching me thinks it is probably truer than I wish to acknowledge. For many that might have this job all that it entails would seem enough. But for one whose original ambition sought to be well known only for my own work, the job alone falls far short. And yet I have continued in this position for nearly seventeen years, so there must be something that keeps me here. That something has always been clear to me, it is the relationships I have developed with the many artists I work with. It is a unique relationship, for although I consider most of them close friends it goes beyond that. The creative process we enjoy is like no other that I can really think of. The closest parallels are those of the cinematographer and film director and/or the master printer and artist. The main difference between either of those situations is the medium itself; Polaroid. The creative process is greatly accelerated by the fact that we are working in an instant medium. To those who have never seen the Polaroid 20×24 camera this may be difficult to grasp. The handmade, 235-pound camera at times defies the artist to make the image they want. While it does some things easily, such as portraiture, many of the other things we ask it to do require hard work, intuitive decision making and on occasion good luck. Its eccentricities are fortunately countered by the fact that we know the results of our efforts in 60 seconds. We learn from our mistakes and build on our successes. The extraordinary reality that a direct camera image this size provides is amplified by the instant aspect of it all. None of us would likely be here trying this with a conventional camera. The payoff keeps one coming back for more. Perhaps the most unusual aspect of my working with the camera and others is my own relationship with the camera. When I first saw it in 1978 while interviewing for the job I thought it was one of the most ridiculous things I had ever seen. I couldn’t see any attraction in it for my work and certainly couldn’t see running it for others. My work at the time was manipulated and painted Polaroid SX-70 prints. The aesthetic of super large format saturated straight color photographs was so alien to me that I eventually turned down the job when it was offered to me. I instead took a position in a research studio within Polaroid, where I worked with all of their films and cameras. My original intent: to stay for three years. Many things changed along the way. I met Karen Nelligan at Polaroid who later became my wife. The camera kept calling to me and in 1980 I moved over to 20×24. In 1981 however the studio as it existed was closed and I was laid off from Polaroid, an early victim of downsizing. The studio situation was restructured and moved to the Boston Museum of Fine Arts School and I became an instructor there. The camera also became an essential part of Polaroid’s Artist Support Program. It was at the Museum School that the reputation of the camera really grew as an artistic force. Local artists such as Rosamond Purcell and Olivia Parker continued their unique and beautiful still life explorations. Rosie Purcell in fact was responsible for bringing me to Polaroid. We became friends while I was in school at Iowa. I invited her to speak at the University of Iowa’s Refocus program. She introduced me to Eelco Wolf of Polaroid in 1977, who supported me with film and cameras for the last two years of my graduate career. Rosie also taught me the transfer process in 1978 for which I am ever grateful. New artists such as Sandi Fellman, Barbara Kasten, Ellen Carey and Luciano Franchi de Alfaro III became regulars in the studio. Many of them would often stay at my house when they came to Boston to use the camera. William Wegman, who was supported by Polaroid in his first efforts on the camera, became the first artist to rent the camera in a substantial way, creating the legendary Man Ray photographs. Bill used to describe us as “Polaroid friends”. We got along so well while we worked but never really spent time with each other outside of the studio, even after I moved to New York. But he worked so often that many of my life’s events were shared with him. He was with me the day my father died and later the day my first child was born. Bill married his wife Christine in the studio while surprising my staff and even his own. A few week later we would have to watch Fay Ray die after a quick and unexpected illness. It has really become “Polaroid family”. I first met Chuck Close during the early Museum School years. I was taken by his sincere interest in me as a person and particularly his interest in my work. He was very encouraging as I struggled to teach my self to be a painter. His advice and support really helped me grow as an artist. When tragedy struck him in 1988 as he became paralyzed, he inspired me all the more with his courage and amazing talent. He fought back to create paintings even stronger than before. His candor about his condition and his own work continue to impress me. He will always be a hero. I have had several opportunities to work with my “heroes”. The first was Lucas Samaras,whom I had done my Master’s thesis on in graduate school. I first had occasion to meet him during a workshop in Boston, before I worked for Polaroid. He seemed quite interested in my SX-70 work, which is unusual for him to show support. I later met him at an opening in 1980 while we were in New York to test market the camera. I told him I now worked for Polaroid and would he be interested in working on the 20×24 Camera. “What are you doing working for Polaroid?” he said, “I thought you were an artist.” I have never forgotten that line. I did bring him the camera to his home no less. I spent a memorable week with him in the fall of 1980 when he completed his “Sittings” series. These were portraits of Lucas and many of the people important to him in New York. I ended up becoming one of his sitters. Pretty heady for a 27-year-old two years out of graduate school. Jerry Uelsmann was one of my favorite photographers when I first became interested in creative photography. I first met him in 1984 in Daytona Beach during bike week in a shoot arranged by Daytona Beach Community College. We hit it off very well and it was an incredible challenge to try and make a “Uelsmann” on such an unwieldy camera. We staged incredibly elaborate multiple exposures with several different magnifications. When we finally succeeded, all we had to do was create an edition. We have since run into each other at workshops across the country and always trade images when we do. Who could ever have thought that when I began in photography that this would come to pass? There are many more artists and relationships I could describe. Many have suggested I should write a book, which is no doubt true.